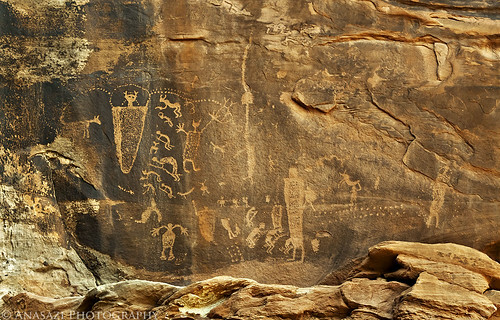 There are so many awesome petroglyph panels near Moab, but this one has got to be one of my favorites in the area. There is a lot going on it this panel, and it’s probably telling a story that we will never understand. My favorite figure is the large Barrier Canyon Style anthropomorph that the smaller ‘supplicant’ figures seem to be facing. This panel is still in excellent condition, and I really hope that it stays that way! I could just sit at the base of this panel and study it all day!